It’s easier to spend less than you earn when you can keep a close eye on what’s going in and out of your bank accounts. 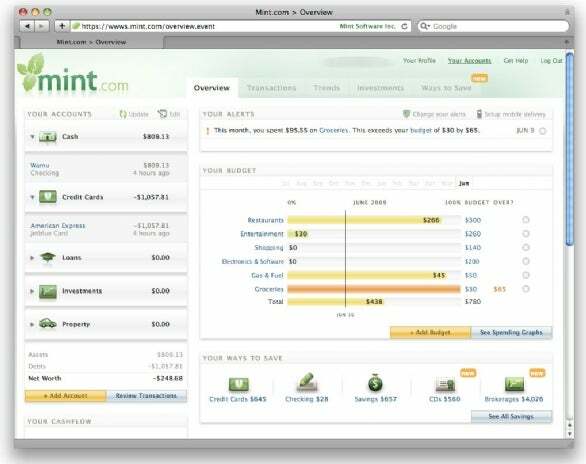 Launching Intuit’s $60 Quicken Mac 2007 ( ) once a month on your home Mac just isn’t going to cut it. Instead, try a Web-based financial manager, which aggregates all your finances—from savings accounts to 401Ks—into a simple, auto-updating interface that makes saving easier. You can track your whole financial picture on your computer or iPhone, receive mobile alerts when you go over budget, and compare and discuss your money strategies with other users who are saving up for a rainy day. Compared to their bloated desktop ancestors, Web-based money managers are stripped down and easier to use, but they’re sometimes missing features that folks with complicated financial situations might need. However, if you just want to keep close track of what goes in and comes out of your bank account in your browser and on your phone, one of these Web-based options is for you. Once Mint connects to your banks and downloads your data, it makes intelligent guesses about what category to assign to each transaction (you can update its choices, of course). For example, it correctly surmised that a charge on my credit card at Lorna’s Italian Kitchen was for a restaurant, and that a purchase at RadioShack should get filed under Electronics & Software. Mint offers both traditional categories and subcategories (such as Auto -> Fuel or Auto -> Parking), as well as free-form tags that let you customize how you filter and chart your expenses and income. Mint lets you monitor your money online or on your iPhone. Mint also offers custom mobile alerts via text message. You can ask Mint to text you if your account balance dips below a certain threshold, whenever you go over budget, or a certain number of days before your credit card bill is due. If you want a simple overview of your finances on the go, the free Mint.com iPhone app ( ) can help. If you already use a desktop version of Quicken, you’ll feel right at home using Intuit’s Web-based personal finance manager, Quicken Online. Many similarities exist between the desktop program and the Web-based option (which used to be a pay-for service but is now free). You can’t manually upload transactions into Quicken—you must enter your online banking user name and password to update your data automatically. Quicken Online updates data with fewer glitches than the other services, however. 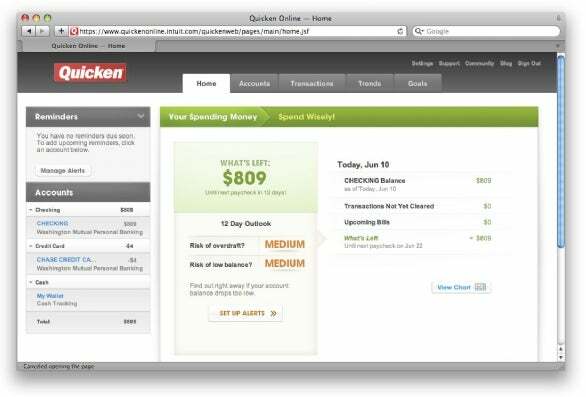 Like the desktop version, Quicken Online lets you schedule future transactions, such as recurring bills and paychecks. It can also examine scheduled transactions and chart what your future account balance will look like by a particular date. Quicken Online offers a My Wallet cash-tracking account for keeping track of the dollars you spend that don’t get their own line on a statement. Quicken Online shows you how much money you’ve got until your next paycheck and sums up your risk of overdraft and low balance. Quicken Online offers the most mature graphs of these online services. In its spending, income, and savings pie and bar charts, you get fine-grained controls for narrowing by date and category, as well as a three-month average baseline for easy visual comparison. It also uses traditional categories and subcategories for transactions, but it doesn’t use tags. That limitation won’t trip up most people, but you might not like it if you’re used to having the freedom to assign more than one tag to your personal data. In my tests, the Web site itself felt sluggish and slow to render compared to the others. Like the other services, Quicken Online offers an iPhone application for entering transactions (especially useful for when you’re out and about and spending cash), finding nearby ATMs, checking upcoming and existing transactions, and monitoring your goals (as in your budget). The service will also send mobile alerts about account activity. Unlike Mint and Wesabe, Quicken Online doesn’t allow you to export your data for analysis in a spreadsheet or save it locally to your Mac. If neither Mint nor Quicken Online supports your bank, you’ve still got an option. Wesabe lets you get financial data into the site in multiple ways: you can enter your login credentials at the Wesabe Web site, manually upload a transaction file, or get a Firefox extension or desktop uploader to do the work for you. Use the manual option or uploaders if Wesabe doesn’t have built-in support for your bank. Wesabe is also a good option if you can’t stand the idea of handing over your account login information, especially if you’re not sure a service will work for you. With Wesabe, you can try things out by just uploading a few transactions by hand. Wesabe is the decidedly geekier option in this group. It doesn’t use traditional categories. Instead, you tag each transaction with keywords. Each transaction can get more than one tag. For example, you can tag the purchase of a public transit pass as both travel and subway. As with Mint and Quicken Online, you can split a transaction, but you must use a special tag format to do so. For example, you could split a $300 deposit into a gift and a paycheck by tagging it gift:100 and paycheck:200. 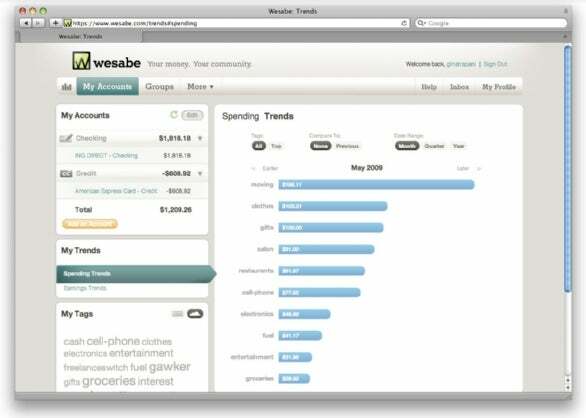 Wesabe charts your spending and earning by tag, and offers a tag cloud on the sidebar to filter transactions. When you first pull your transactions into Wesabe, the service does not automatically apply likely tags to your transactions, unlike Mint and Quicken Online. You can, however, set up tag rules. For example, you can tell Wesabe that any transaction with the phrase AT&T in the description should get tagged as cell phone. Wesabe can also tag existing transactions based on such a rule. The initial time you’ll invest in coming up with a tag vocabulary and applying it to your transactions pays off; Wesabe suggests already used tags as you type whenever you edit a transaction. Wesabe’s spending and earning charts only make sense if all your transactions have meaningful tags. To tag any stragglers, click on the Unedited button under Transaction Activity. Type your tags into the top transaction and click on Save & Edit Next to move to the next item quickly. Repeat until you’ve tagged every transaction. Then visit Wesabe’s dashboard (click on the bar-chart button at the top left) to see pie charts of your spending and earning classified by tag. Wesabe also offers a simplified budgeting mechanism called Spending Targets. Click on Add Spending Target on your Wesabe dashboard to enter a tag. Then enter the amount you want to spend on that tag per month (say, restaurants, $300). Wesabe tells you how many days are left in the current month, and how much money you’ve got left for that tag based on your target. Wesabe’s user community consists of discussion groups centered around finance topics. Browse and join groups based on your goals and interests (say, Frugal Foodies or Buying a House), and Wesabe will embed current discussion topics from that group in the sidebar. These groups can be surprisingly interesting and helpful, turning a solitary (and sometimes scary) task into a social one. To keep up with Wesabe on the go, you can use the free Wesabe iPhone app to view your account activity, add and update transactions, and check whether you’ve stayed within your budget. Gina Trapani is the author of Upgrade Your Life: The Lifehacker Guide to Working Smarter, Faster, Better (Wiley, 2008).